It’s been years since I’ve made granola, years since I’ve eaten it. 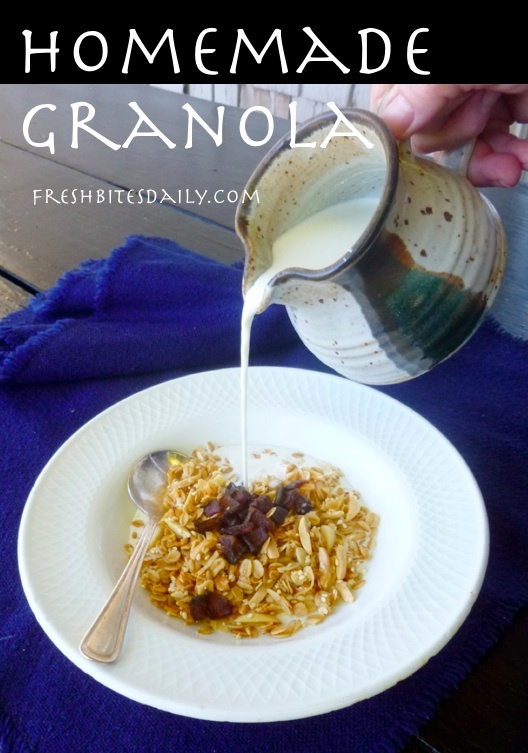 Lauren’s post on granola making caught my eye because we had a gallon of oats in the pantry. When I got rained out of a morning of gardening, I knew this was the time, if the time was ever to be. Two questions loomed regarding Lauren’s recipe: (1) Can you use regular oats in place of the quick oats? I used regular oats and the answer is yes. You may have to chew just a bit more, but that’s good for you. (2) If you are not a chocoholic, can you make a caramel flavor? The answer is: almost. I ended up with more of a toffee flavor using organic unrefined sugar. It tastes much like regular brown sugar and supports the toffee theme along with extra butter. The major revision I made to the inspiration recipe was to double the butter. I have to confess to being a butter lover and I thought the double portion would make for crispier granola — it is wonderfully crispy as it turns out. To test the two flavors, I divided the recipe in half and created a different flavor with each half. It is an easy way to end up with several batches of granola with different flavors and additions. You already have the main components sitting on the counter. 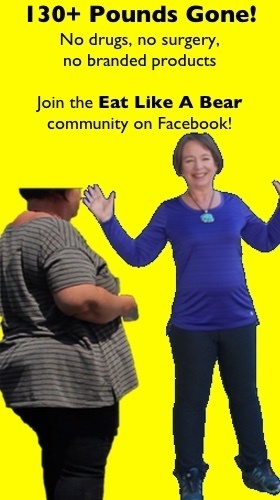 It’s just so easy (and fun). I remember now why I stopped making granola. It is so yummy I want to keep eating it. To foster some self-discipline, I am packaging the granola in small containers to use as travel food — only one container per trip. We’ll see how that goes. Are your ready to try some for yourself? This is super quick and easy. You just need to put it together when you will be near the kitchen for an hour while it roasts. For about 6 cups of chocolate granola — one cookie sheet. Measure the oats, almonds, and coconut into a large bowl. Melt the butter in a small heavy pot. Add the maple syrup and vanilla. If the powdered cocoa is lumpy, mush the lumps with a spoon so the powder will be evenly distributed on the oat mixture. Add the cocoa powder to the butter mixture and stir well. Pour the butter mix over the oat mix and stir to coat all the oats. Spread the granola on a large cookie sheet and bake at 250 degrees for one hour. Stir it 2-3 times during that hour for more even cooking. 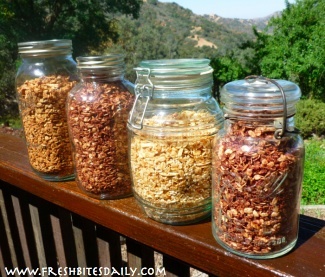 Remove granola from the oven and let the granola cool completely before putting it in an appropriate container. As it cools the granola gets crispy. After some days your granola will lose some of its crispy texture. To renew the crisp, put granola on a cookie sheet and leave it in the oven under the pilot for several hours. 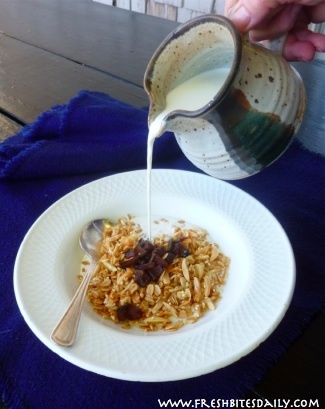 To make the toffee flavored granola, replace the maple syrup with organic whole cane sugar or regular brown sugar. Eliminate the powdered cocoa and follow the same procedure. This granola is a fine foundation for your kitchen creativity. Experiment with different seasonings and flavors, different nuts and dried fruits, different butters and oils. You can hardly go wrong!